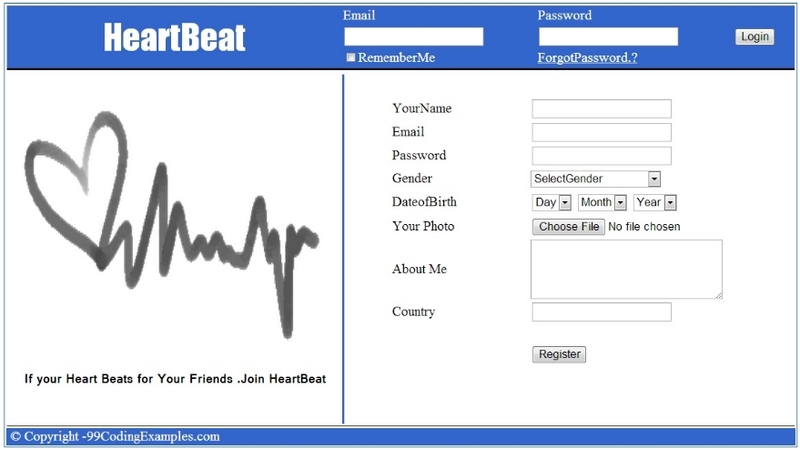 The Login or SignIn form on our social network heartbeat is a part of master page. Open HomeMaster.master MasterPage Which You have created In the Source of HomeMaster.master you can add the following piece of code given below. We have added the login form on the master page itself. On HomeMaster.master page we have made a struture some what similar to facebook. The login form contains EmailId Password fields which are compulsory for the user to authinticate. <asp:Label ID="Label1" runat="server" Font-Names="Impact" Font-Size="30pt" Text="HeartBeat"
In HomeMaster.master.cs file you can add the following piece of code given below. In the codebehind we have an LoginButton Onclick event which checks whether the emailid and password entered by user are correct or not.